The ultimate beach house - Minutes from Hastings Street, in the exclusive enclave of Witta Circle, Noosa Sound. This large home has everything you would need for a perfect holiday. Number 63 is nestled in an exclusive enclave of Noosa. The modern house has everything needed for your stay and generously furnished in a contemporary style. Entertaining has certainly been the focus, with a commercially equipped kitchen that opens out to a number of alfresco areas. Spend your holiday relaxing by the horizon pool, fishing on your own jetty, or reading a book on your private beach. Internally the home offers 7 'five star' bedrooms, 3 bathrooms and study zone. There is a sunken lounge area, complete with all the mod-cons including Bose sound system. There will be no reason to leave the house! There are also a total of 8 TV's within the house. The property is listed as pet friendly, please advise the breed of the dog with your enquiry. Linen charge of $15 per person applies. Minimum of 5 night stays. Please note that the pool is not heated but is in a sunny position and warm enough to be enjoyed all year round. 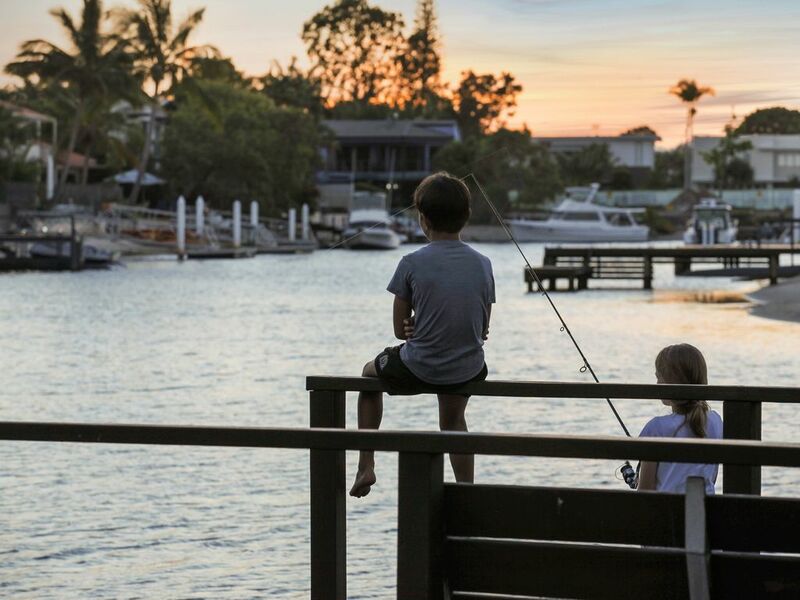 Whether you're looking for a private romantic escape, want to explore nature or some quality family time, Noosa's surroundings are for any holiday maker looking to soak up Queensland’s celebrated sun and surf. Have an outdoor adventure - walk, dive, paddle, ride or cycle through Noosa's coastal and hinterland landscapes. Swim at Noosa's Main beach or in quainter spots like Tea Tree Bay. Discover many of Noosa's natural wonders in a leisurely way, strolling through the National Park. There are many recreational activities that the whole family can enjoy. The broader sunshine coast area also offers many day tripping adventures - if you would ever want to leave this house and Noosa! We recently stayed with extended family to celebrate a family members birthday. The house was perfect for our large group. The house was very comfortable and in a great location. Would be happy to stay again. Good value for money, knowing how much you can pay for other nearby properties. Ideally located within a five minute walk to Hastings Street and facing west for magnificent sunset views. Off street parking for three vehicles. Great kitchen with excellent range of appliances. Ideal for families with small children - great swimming pool and a jetty to feed fish, stingrays, ducks and pelicans. We were a family of six adults and three children and were very comfortable staying there and really enjoyed the experience. This house is in a great location, but unfortunately needs a really good renovation. The walls are paper thin so you hear everything, the bedroom layout is like a rabbit warren. The bedding was very basic (the bunk bed doonas didn’t even have covers). 3 different tradespeople showed up at the house during our stay, unannounced, the gardener being extremely disruptive even after being told our baby was asleep and requested they be quiet (he started his chainsaw at her window). Sadly we didn’t enjoy our holiday as much as we expected. Not the first time we have stayed at the Noosa Beach House, and we had another fantastic stay. Highly recommend this property for families coming together for a holiday. The house is well equipped for large groups, and has everything you need to relax and entertain. The central location makes it easy to walk over to Hasting St and the beach. I am sure we will be back again, thank you Elise. We really enjoyed our stay. Plenty of room for 13 people and a baby! A few small maintenance issue to be rectified, but overall a great experience. We had a perfect stay at the house. Nothing to fault, I would highly recommend it. Lots of space and perfect location.